Table runners are an easy and effective way to dress up an ordinary table and they come in a wide variety of sizes, materials and colors. While you can follow guidelines when using table runners, you may also decide to get creative and use them in different ways. 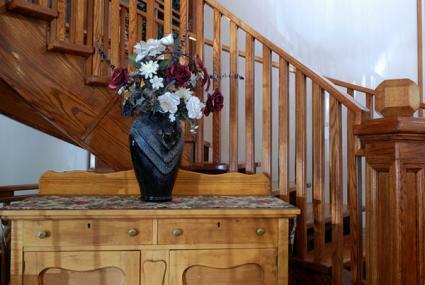 Typically, a table runner should hang over each side of the table where the ends fall. This is much more esthetically pleasing than a runner that stops where the table ends or is slightly shorter than the table. The amount of hang should be equal on both sides and can vary, just like the drop length of a tablecloth. 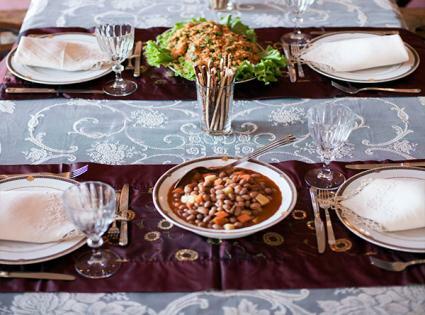 A standard tablecloth drop can be from 6 to 12 inches. If you use a runner with a tablecloth, the drop length should be the same for both. The width of a table runner should be roughly 1/3 the width of the table it is being used on when running lengthwise. 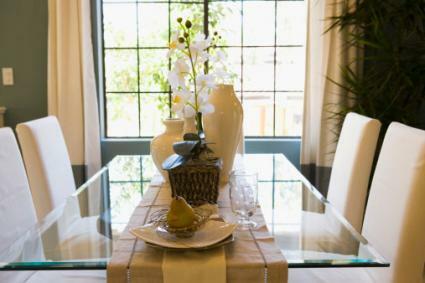 For table runners placed across the width of a dining table, the runners should be narrower or about 1/4 the width of the table. If you use a runner that is shorter in length than the table, make sure it is significantly shorter and use it underneath a centerpiece. You will need to measure the width and length of your table first. Then add a minimum of 12 inches and a maximum of 24 inches to the length measurement to determine what sizes of table runners will work for your table. Remember to consider the width measurement of your table and choose a runner with a width measurement about one third of that size. Most table runners come in standard widths such as 10, 12, 13, 14 or 15 inches and standard lengths such as 54, 72, 90 and 108 inches. If you have a dining table that is 84 inches long and 42 inches wide (7 feet by 3.5 feet), you would need a table runner with the dimensions of 14 inches by 108 inches. Remember that there are no real rules for using table runners. Don't worry if the width of a table runner you like is not exactly one third the width of your table. The length can also be a little shorter or longer than the suggested guidelines, if you still like how it looks. Try to follow the size guidelines when decorating for more formal occasions such as weddings. If these standard sizes don't work with your table size, you may need to order a custom made table runner or make one yourself. 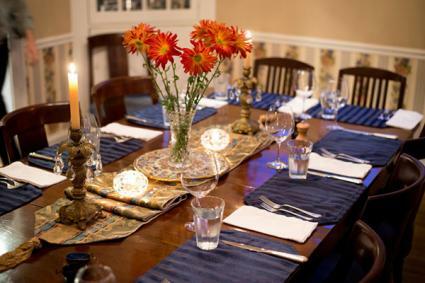 The most common way to use a table runner is to place the runner in the middle of the table, running lengthwise. This provides a perfect guide or path to keep multiple centerpieces or serving dishes in line. 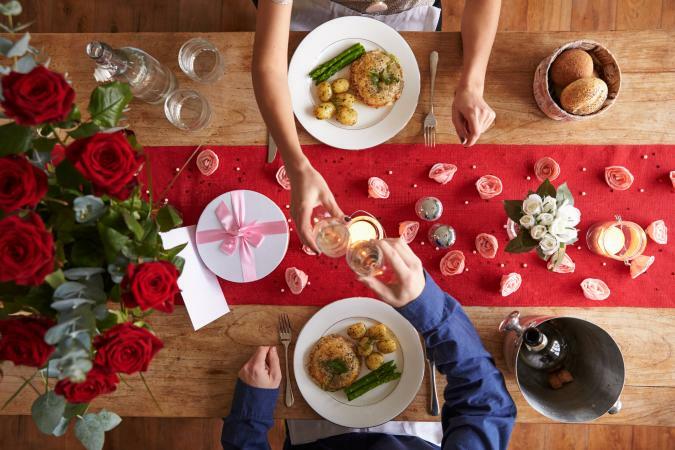 The runner can also be used to protect the table's surface from candle wax drippings, moisture, heat, food drippings and other debris caused by centerpieces, serveware or décor. 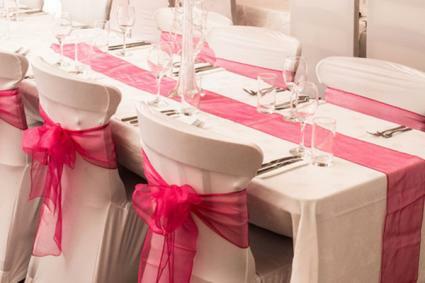 You can also use slightly narrower and shorter table runners placed across the table in front of each chair. These runners can serve as placemats and can be used in addition to a lengthwise runner or without one. Runners placed across extra long tables can be used to separate each place setting. Placemats can be used with table runners in the exact same fabric or in colors, textures and patterns that complement each other. 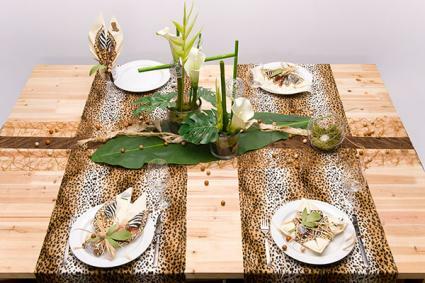 The option of whether or not to include a tablecloth will depend on how formal the setting is. It may also depend on the type of table, such as whether or not the tabletop itself contains decorative elements like inlaid tile. The runner should not look identical to the tablecloth or be the same color; it should stand out. Shorter table runners can be draped over a nightstand or end table for a splash of color and texture. You can also use table runners to accent other types of furniture such as a buffet, hutch, credenza, dresser or vanity table. Use a table runner to protect furniture made with glass. Use one on a glass display case, console or coffee table when you want to display knick-knacks that might scratch the surface. The color, pattern and texture of a table runner should match, complement or contrast nicely with the surface underneath, the items placed on top and the style of the room. For example, it wouldn't make much sense to put a silk table runner with a Chinese calligraphy pattern on a rustic cedar dining table in a lodge-style, log home. However, this kind of runner would look lovely on an Asian-style, lacquered rosewood dining table. Fabrics with smooth, shiny textures like silk, satin, organza and polyester work best on tables with similar textures like glass and highly lacquered wood or with formal linen tablecloths. These fabrics work well for formal occasions like weddings, award ceremonies, special events, etc. Fabrics with natural, coarse or dense textures like bamboo, grass cloth, twill, cotton and cotton blends work best on wood, metal, stone and ceramic tiled tables. These fabrics are better for informal, casual use . Tablecloth Factory - This retailer offers a wide variety of formal table runners in shiny satins, embroidered styles, sequins, organza, taffeta and lace. Crate and Barrel - At Crate and Barrel, you'll find a small collection of rustic table runners in texture rich fabrics such as linen, wool and hemp. Pottery Barn - Mixed in with tablecloths, runners here feature a bold American flag print, a seascape, natural fruit prints, earth-tone colors and subtle stripes. Etsy - A quick search for table runners brings back a lovely assortment of handmade quilted runners, floral designs, colorful Mexican stripes, seasonal themes, and other prints perfect for everday use. Table runners are perfect for adding extra color and texture to table settings and other types of furniture. They look best when used under other decorative items by helping to draw the eye toward the display and serving as an anchor for multiple accents.